What is 5 Simple Keys®? For the last 100 years, the game's best players have exhibited very few similarities. We at Medicus Golf came to this conclusion by spending countless hours studying literally hundreds of the game's greatest golfers. Looking at these players with this goal in mind allowed us to identify a small and distinct set of commonalities that we call the 5 Simple Keys. Let's take a look at each of them now! AMM data shows that the average PGA Tour player moves his head only one inch during the swing. This is important because when your head is relatively steady you can see the ball without relying on your peripheral vision, making hitting the ball solidly that much easier! To keep your head relatively steady, stretch your right side (for a right-handed golfer) from your ankle to your armpit, removing the wrinkles from your pants and shirt and forming a line up the side of your body. Simultaneously, move your left shoulder downward as it rotates away from the target. These movements allow the shoulders to turn 90° to the address spine angle and complete a fairly centered shoulder turn. The steady head provides a reference point for this turn and sets the foundation for the remaining Keys. The first Key is mostly about side-to-side motion of the head. It's perfectly acceptable for the head to dip down some during the downswing. As you can see from the photo, Chuck's head has moved downward from the top of his backswing. This happens because his body is compressing as he prepares to explode into the golf ball. This move is also shared by the game's best players, particularly the longer hitters. Just remember, when it comes to a steady head, it's okay for your head to move downward, but do all you can to eliminate the lateral motion or swaying of your head. The average PGA Tour player arrives at impact with 80-95% of their weight on the forward leg. The average amateur gets only 55% of their weight forward at impact! The movement of the hips towards the target with the weight progressing forward is one of the most noticeable differences between the greatest and poorest players. To train the proper hip movement, take a training stick and put it in the ground about the width of your hand away from your left thigh. That's about as far as your hips will need to move during the downswing. Practice bumping into the stick by maintaining the flex in your left knee as you move your hips forward. How many people do you see at your local practice range finishing their swings on their back foot? It is way too common, and though those golfers may have rotated their hips and shoulders, they've done so with their weight on their right sides. They've got virtually no chance of hitting a solid shot! 1. Set up over the ball as you normally would. 2. Move your left knee and hip towards the target and open them slightly. Let your hands shift towards your left thigh as you do this. You'll feel more weight on your forward leg. 3. 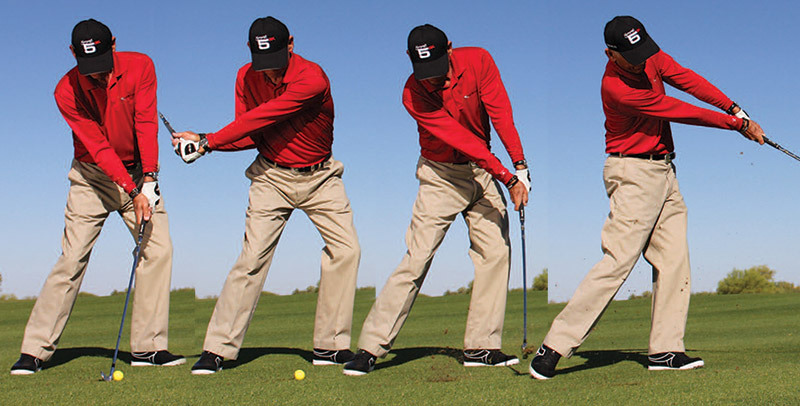 Make a half to three-quarter backswing leaving your left knee and hip forward. 4. 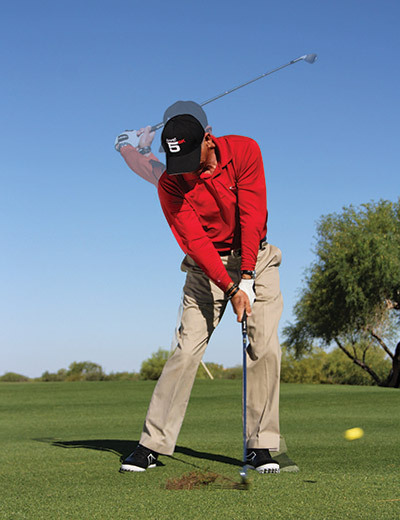 From there, bump the hips even farther forward, hit the ball, and swing to an abbreviated finish. Doing this drill properly will set you on the path to achieving Tour-quality impact. If you're still hitting shots fat and thin, check out Key #3. Control Low Point and Stop the Flip! Everyone knows there are no flippers on the PGA Tour. It's an entirely different story at your local practice range! PGA Tour players are really good at achieving Keys #1 and #2, which makes achieving Key #3: Inline Impact that much easier. An inline impact (originally "flat left wrist") keeps the shaft of the club from passing the left arm prior to impact. When the shaft passes the left arm prematurely, it's commonly called a "flip" and this move virtually assures lots of fat and skulled shots. To learn what an inline impact feels like, try the drill Chuck demonstrates in the YES photo on the right. 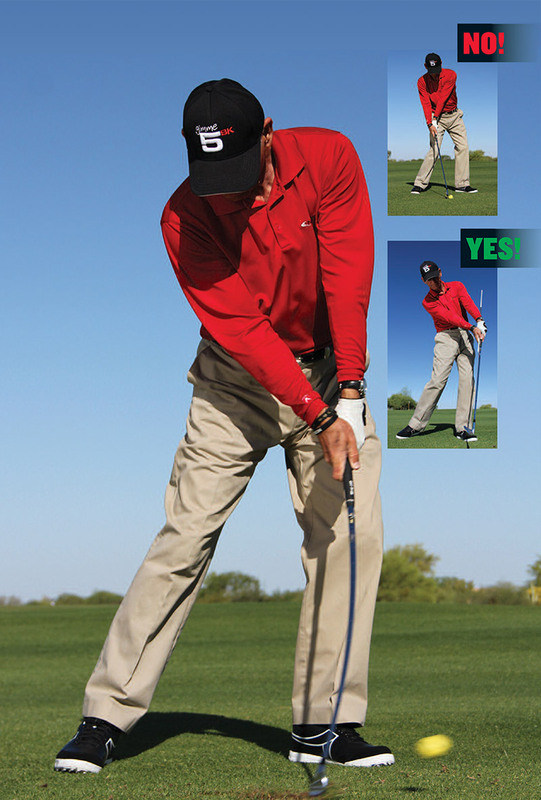 Take a training stick and put it in the grip of your club so that a foot or so sticks out. Practice hitting the ball first, then the ground, without letting the stick hit you in your midsection. While the first three keys are built to ensure a pure, compressed strike on the golf ball, the last two get down to brass tacks in terms of controlling the flight. Because your golf clubs are bent at an angle and golf is played from the side, you don't swing the golf club on a perfectly horizontal plane (along the floor) or vertical plane (up and down a wall), but rather, you swing it on a tilted plane (along the roof of a house). Though this Key matters most during the downswing, a backswing which follows the tilted plane back, up, and in as if you are swinging your hands and the sweetspot from the gutter to the peak of a roof will put you in a better position to make a solid downswing. 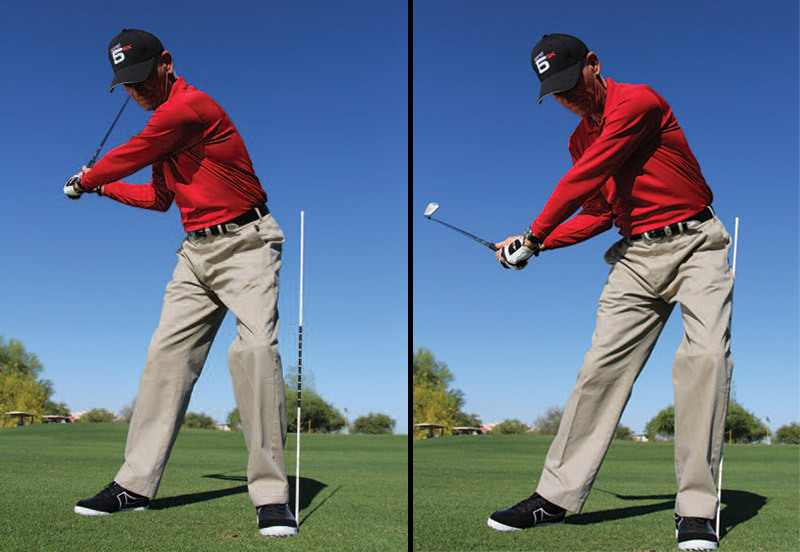 A good backswing puts you in the position to deliver the clubhead from the inside. The sweetspot will travel diagonally forward, down, and out towards the golf ball. To practice this, we like to use a training aid called the VisionTrack (Chuck is using it in the photos). 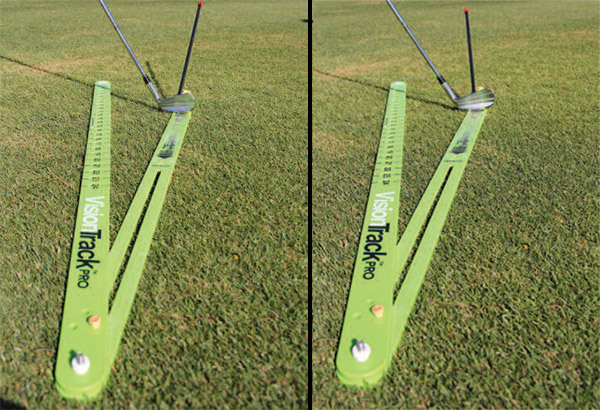 This tool helps groove the inside-out diagonal sweetspot path. As you can see in the photos, the sweetspot travels from "in" (the left side of the frame) to "out" (the right side of the frame) throughout the entire downswing. Hit a few balls and work on this. Don't worry which way the ball is curving - we're covering that next in Key #5! Regardless of whether Chuck is hitting a draw or a fade, knowing and employing the proper ball flight laws will allow him to start the ball to the proper side of the target and curve it towards the flagstick. Given the proper diagonal sweetspot path, the final Key is controlling the clubface at impact. Available technology such as Flightscope and high-speed cameras have proven that the golf ball starts generally in the direction the clubface is pointing at impact and curves away from the path. In these three photos, let's assume Chuck has hit the golf ball with the same diagonal sweetspot path (traveling slightly in to out). The swing on the left would likely produce a shot that starts too straight and curves left of the target. The middle swing (with the face pointing right of the target at impact), will push the ball to the right and draw it back. The swing on the right likely produced a straight push in which the clubface and path matched. When we teach our students, we use the terms "open" and "closed" face to refer to the clubface orientation relative to the path. If the face is open to the path, the ball will fade, and if it's closed, the ball will draw. A proper fade is hit with a clubface aiming left of the target at impact, and a proper draw with one aiming right of the target at impact. Two shots are illustrated to the left. The left image shows the clubface matching the path and will result in a straight push. The image on the right shows a face closed to the path, resulting in a draw. Both of these shots can be perfectly playable, depending on the target. That's the beauty of clubface control! Knowing the true ball flight laws and how to achieve them is the last Key to great scoring and incredible golf!